Star is a cute tiny 55lb brindle girl that is sweet, playful and funny according to her foster family. She gets along well with other dogs of all sizes but is a bit too interested in chasing cats to be OK living with them. She has lived with small dogs in her foster home with no problem. She has liked the children she has met so far. This tiny beauty has looks and personality and you can't help but smile around her. Update from her new foster home! Star is an amazing little angel! She came right into her new surroundings without hesitation, meeting everyone calmly and carefully checking everything around her. She sleeps peacefully and quietly in her crate and has been totally clean without any accidents inside. 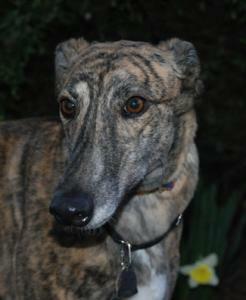 This is a VERY nice girl who will be the perfect first greyhound or addition to an established pack. The first family who meets her for adoption will fall head over heels in love!